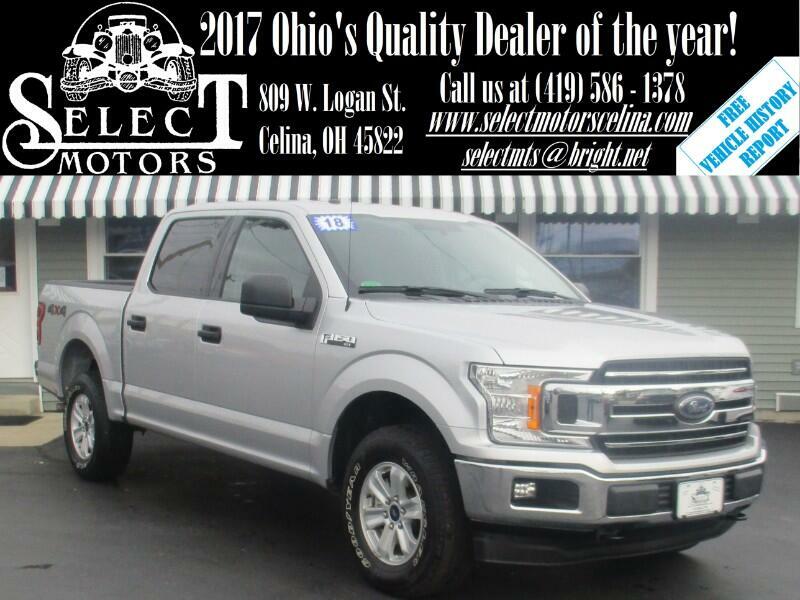 ***TXT US @: (419) 362 - 6200*** 5.0L V8, 4x4, backup camera, automatic headlights, fog lights, compass, outside temperature, A/C, power windows/locks/mirrors, keyless entry, AM/FM, auxiliary and USB port, steering wheel mounted audio controls, Bluetooth, tilt and telescopic steering wheel, cruise control, information center, 17" alloy wheels. Warranties: Balance of Ford's 3 year or 36,000 mile bumper to bumper and 5 year or 60,000 mile powertrain. In service date: 03/18/2018. Extended service contracts available. There's a deep catalog of features, options, packages, engines and bed configurations for the 2018 Ford F-150, starting with six main trim levels: base XL, XLT, Lariat, King Ranch, Platinum and Limited. There's also the high-performance off-road Raptor variant that exists outside the standard lineup. The XL with the 101A package makes for a decent work truck, but upgrading to the XLT with the 301A package makes for a more passenger-friendly pickup. The Lariat is the gateway to the luxury truck you've been saving for. The Ford F-150 offers three cab styles — regular, SuperCab (extended) and SuperCrew (crew cab) — and three bed lengths, depending on cab style. A standard bed (6 feet 6 inches) or a long bed (8 feet) is available on regular and SuperCab styles, while the SuperCrew offers either a short bed (5 feet 6 inches) or the standard bed. Several engines are also available, starting with a new 3.3-liter V6 engine that makes 290 horsepower and 265 pound-feet of torque. It pairs with a six-speed automatic transmission. A turbocharged 2.7-liter V6 is next (325 hp, 400 lb-ft), followed by a 5.0-liter V8 (395 hp, 400 lb-ft), then a turbocharged 3.5-liter V6 (375 hp, 470 lb-ft) available in two power grades: 375 hp and 470 lb-ft or 450 hp and 510 lb-ft. These three engines all pair with a 10-speed automatic transmission. Standard features on the base XL trim level include 17-inch steel wheels, automatic headlights, trailer sway control, pre-wired trailer connections, manual mirrors and windows, vinyl flooring, a cloth-upholstered 40/20/40-split front bench, a tilt-and-telescoping steering wheel, a driver information display, air-conditioning, a 4.2-inch central display screen and a four-speaker radio with an auxiliary jack. SuperCab and SuperCrew models come with 60/40-split folding rear seats and two additional speakers, and four-wheel-drive models get front tow hooks. The 3.3-liter engine is standard on most XL configurations, but some RWD extended- and crew-cab models require the 2.7-liter V6, and the V8 comes on 4WD versions of those models. An optional 101A package adds power windows and locks (including the tailgate), power mirrors, remote locking and unlocking, cruise control, Ford's MyKey vehicle control feature, a larger driver information screen, Sync voice controls, Bluetooth, smartphone app integration, a USB port and a CD player. The XLT trim includes features from the XL's optional 101A package along with alloy wheels, chrome bumpers and exterior trim, foglights, a keypad entry system, rear privacy glass, carpeting, driver and passenger seat lumbar adjustments, and additional interior storage bins and pockets. There are a few options for the XLT. The Mid 301A option package adds heated mirrors, an auto-dimming driver-side and rearview mirror, a trailer hitch, a cargo management system with four tie-down cleats, an eight-way power-adjustable driver seat (with power lumbar adjustment), power-adjustable pedals, rear under-seat storage, a leather-wrapped steering wheel, a rearview camera, and a seven-speaker sound system with satellite radio. The Luxury 302A package builds on the above features with rear parking sensors, remote ignition, heated and 10-way power-adjustable front seats (with power lumbar adjustment), an 8-inch touchscreen (with Sync 3, Apple CarPlay and Android Auto) and an additional USB port. Notable stand-alone options include box side steps, a regular sunroof (SuperCab), a panoramic sunroof (SuperCrew), blind-spot monitoring with rear cross-traffic alert, inflatable rear seat belts, and a navigation system.